Due to its high degree of microporosity, just one gram of activated carbon has a surface area in excess of 3,000 m2 (32,000 sq ft), as determined by gas adsorption. An activation level sufficient for useful application may be attained solely from high surface area; however, further chemical treatment often enhances adsorption properties. Activated carbon is used in gas purification, decaffeination, gold purification, metal extraction, water purification, medicine, sewage treatment, air filters in gas masks and respirators, filters in compressed air and many other applications. 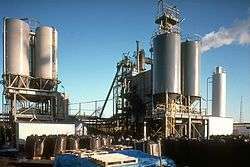 One major industrial application involves use of activated carbon in the metal finishing field. It is very widely employed for purification of electroplating solutions. For example, it is a main purification technique for removing organic impurities from bright nickel plating solutions. A variety of organic chemicals are added to plating solutions for improving their deposit qualities and for enhancing properties like brightness, smoothness, ductility, etc. Due to passage of direct current and electrolytic reactions of anodic oxidation and cathodic reduction, organic additives generate unwanted breakdown products in solution. Their excessive build up can adversely affect the plating quality and physical properties of deposited metal. Activated carbon treatment removes such impurities and restores plating performance to the desired level. Activated carbon is used to treat poisonings and overdoses following oral ingestion. Tablets or capsules of activated carbon are used in many countries as an over-the-counter drug to treat diarrhea, indigestion, and flatulence. Activated carbon, in 50% w/w combination with celite, is used as stationary phase in low-pressure chromatographic separation of carbohydrates (mono-, di-trisaccharides) using ethanol solutions (5–50%) as mobile phase in analytical or preparative protocols. Activated carbon is usually used in water filtration systems. 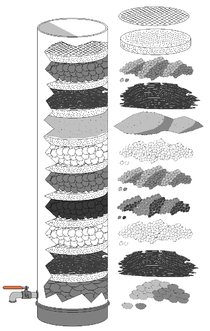 In this illustration, the activated carbon is in the fourth level (counted from bottom). Volatile organic compounds capture from painting, dry cleaning, gasoline dispensing operations, and other processes. In 2007, Ghent University, Belgium, began research in water treatment after festivals. A full scale activated carbon installation was built at the Dranouter music festival in 2008, with plans to utilize the technology to treat water at this festival for the next 20 years. Activated carbon (charcoal) is an allowed substance used by organic farmers in both livestock production and wine making. In livestock production it is used as a pesticide, animal feed additive, processing aid, nonagricultural ingredient and disinfectant. Benefits in case of animal feed additive are questionable. In organic winemaking, activated carbon is allowed for use as a processing agent to absorb brown color pigments from white grape concentrates. Activated carbon filters (AC filters) can be used to filter vodka and whiskey of organic impurities which can affect color, taste, and odor. Passing an organically impure vodka through an activated carbon filter at the proper flow rate will result in vodka with an identical alcohol content and significantly increased organic purity, as judged by odor and taste. Research is being done testing various activated carbons' ability to store natural gas and hydrogen gas. The porous material acts like a sponge for different types of gases. The gas is attracted to the carbon material via Van der Waals forces. Some carbons have been able to achieve bonding energies of 5–10 kJ per mol. The gas may then be desorbed when subjected to higher temperatures and either combusted to do work or in the case of hydrogen gas extracted for use in a hydrogen fuel cell. Gas storage in activated carbons is an appealing gas storage method because the gas can be stored in a low pressure, low mass, low volume environment that would be much more feasible than bulky on board compression tanks in vehicles. The United States Department of Energy has specified certain goals to be achieved in the area of research and development of nano-porous carbon materials. All of the goals are yet to be satisfied but numerous institutions, including the ALL-CRAFT program, are continuing to conduct work in this promising field. Filters with activated carbon are usually used in compressed air and gas purification to remove oil vapors, odor, and other hydrocarbons from the air. The most common designs use a 1-stage or 2 stage filtration principle in which activated carbon is embedded inside the filter media. Activated carbon is also used in spacesuit Primary Life Support Systems. Activated carbon filters are used to retain radioactive gases within the air vacuumed from a nuclear boiling water reactor turbine condenser.The large charcoal beds absorb these gases and retain them while they rapidly decay to non-radioactive solid species. The solids are trapped in the charcoal particles, while the filtered air passes through. Activated carbon is commonly used on the laboratory scale to purify solutions of organic molecules containing unwanted colored organic impurities. Since it is often not recycled, the mercury-laden activated carbon presents a disposal dilemma. If the activated carbon contains less than 260 ppm mercury, United States federal regulations allow it to be stabilized (for example, trapped in concrete) for landfilling. However, waste containing greater than 260 ppm is considered to be in the high-mercury subcategory and is banned from landfilling (Land-Ban Rule). This material is now accumulating in warehouses and in deep abandoned mines at an estimated rate of 1000 tons per year. The problem of disposal of mercury-laden activated carbon is not unique to the United States. In the Netherlands, this mercury is largely recovered and the activated carbon is disposed of by complete burning. Activation/Oxidation: Raw material or carbonized material is exposed to oxidizing atmospheres (oxygen or steam) at temperatures above 250 °C, usually in the temperature range of 600–1200 °C. Chemical activation: Prior to carbonization, the raw material is impregnated with certain chemicals. The chemical is typically an acid, strong base, or a salt (phosphoric acid, potassium hydroxide, sodium hydroxide, calcium chloride, and zinc chloride 25%). Then, the raw material is carbonized at lower temperatures (450–900 °C). It is believed that the carbonization / activation step proceeds simultaneously with the chemical activation. Chemical activation is preferred over physical activation owing to the lower temperatures and shorter time needed for activating material. Activated carbons are complex products which are difficult to classify on the basis of their behaviour, surface characteristics and other fundamental criteria. However, some broad classification is made for general purpose based on their size, preparation methods, and industrial applications. A micrograph of activated charcoal (R 1) under bright field illumination on a light microscope. Notice the fractal-like shape of the particles hinting at their enormous surface area. Each particle in this image, despite being only around 0.1 mm across, has a surface area of several square meters. The entire image covers a region of approximately 1.1 by 0.7 mm, and the full resolution version is at a scale of 6.236 pixels/μm. Normally, activated carbons (R 1) are made in particulate form as powders or fine granules less than 1.0 mm in size with an average diameter between 0.15 and 0.25 mm. Thus they present a large surface to volume ratio with a small diffusion distance. Activated carbon (R 1) is defined as the activated carbon particles retained on a 50-mesh sieve (0.297 mm). PAC material is finer material. PAC is made up of crushed or ground carbon particles, 95–100% of which will pass through a designated mesh sieve. The ASTM classifies particles passing through an 80-mesh sieve (0.177 mm) and smaller as PAC. It is not common to use PAC in a dedicated vessel, due to the high head loss that would occur. Instead, PAC is generally added directly to other process units, such as raw water intakes, rapid mix basins, clarifiers, and gravity filters. Granular activated carbon has a relatively larger particle size compared to powdered activated carbon and consequently, presents a smaller external surface. Diffusion of the adsorbate is thus an important factor. These carbons are suitable for adsorption of gases and vapors, because they diffuse rapidly. Granulated carbons are used for water treatment, deodorization and separation of components of flow system and is also used in rapid mix basins. GAC can be either in granular or extruded form. GAC is designated by sizes such as 8×20, 20×40, or 8×30 for liquid phase applications and 4×6, 4×8 or 4×10 for vapor phase applications. A 20×40 carbon is made of particles that will pass through a U.S. Standard Mesh Size No. 20 sieve (0.84 mm) (generally specified as 85% passing) but be retained on a U.S. Standard Mesh Size No. 40 sieve (0.42 mm) (generally specified as 95% retained). AWWA (1992) B604 uses the 50-mesh sieve (0.297 mm) as the minimum GAC size. The most popular aqueous phase carbons are the 12×40 and 8×30 sizes because they have a good balance of size, surface area, and head loss characteristics. Extruded activated carbon combines powdered activated carbon with a binder, which are fused together and extruded into a cylindrical shaped activated carbon block with diameters from 0.8 to 130 mm. These are mainly used for gas phase applications because of their low pressure drop, high mechanical strength and low dust content. Also sold as CTO filter (Chlorine, Taste, Odor). Bead activated carbon is made from petroleum pitch and supplied in diameters from approximately 0.35 to 0.80 mm. Similar to EAC, it is also noted for its low pressure drop, high mechanical strength and low dust content, but with a smaller grain size. Its spherical shape makes it preferred for fluidized bed applications such as water filtration. Porous carbons containing several types of inorganic impregnate such as iodine, silver, cations such as Al, Mn, Zn, Fe, Li, Ca have also been prepared for specific application in air pollution control especially in museums and galleries. Due to its antimicrobial and antiseptic properties, silver loaded activated carbon is used as an adsorbent for purification of domestic water. Drinking water can be obtained from natural water by treating the natural water with a mixture of activated carbon and Al(OH)3, a flocculating agent. Impregnated carbons are also used for the adsorption of Hydrogen Sulfide(H2S) and thiols. Absorption rates for H2S as high as 50% by weight have been reported. This is a process by which a porous carbon can be coated with a biocompatible polymer to give a smooth and permeable coat without blocking the pores. The resulting carbon is useful for hemoperfusion. Hemoperfusion is a treatment technique in which large volumes of the patient's blood are passed over an adsorbent substance in order to remove toxic substances from the blood. 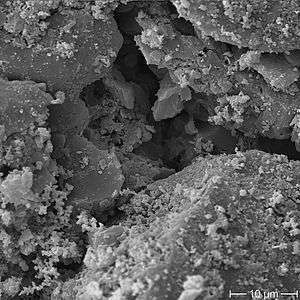 Under an electron microscope, the high surface-area structures of activated carbon are revealed. Individual particles are intensely convoluted and display various kinds of porosity; there may be many areas where flat surfaces of graphite-like material run parallel to each other, separated by only a few nanometers or so. These micropores provide superb conditions for adsorption to occur, since adsorbing material can interact with many surfaces simultaneously. Tests of adsorption behaviour are usually done with nitrogen gas at 77 K under high vacuum, but in everyday terms activated carbon is perfectly capable of producing the equivalent, by adsorption from its environment, liquid water from steam at 100 °C (212 °F) and a pressure of 1/10,000 of an atmosphere. James Dewar, the scientist after whom the Dewar (vacuum flask) is named, spent much time studying activated carbon and published a paper regarding its adsorption capacity with regard to gases. In this paper, he discovered that cooling the carbon to liquid nitrogen temperatures allowed it to adsorb significant quantities of numerous air gases, among others, that could then be recollected by simply allowing the carbon to warm again and that coconut based carbon was superior for the effect. He uses oxygen as an example, wherein the activated carbon would typically adsorb the atmospheric concentration (21%) under standard conditions, but release over 80% oxygen if the carbon was first cooled to low temperatures. Activated carbon does not bind well to certain chemicals, including alcohols, diols, strong acids and bases, metals and most inorganics, such as lithium, sodium, iron, lead, arsenic, fluorine, and boric acid. Activated carbon adsorbs iodine very well. The iodine capacity, mg/g, (ASTM D28 Standard Method test) may be used as an indication of total surface area. Carbon monoxide is not well adsorbed by activated carbon. This should be of particular concern to those using the material in filters for respirators, fume hoods or other gas control systems as the gas is undetectable to the human senses, toxic to metabolism and neurotoxic. Substantial lists of the common industrial and agricultural gases adsorbed by activated carbon can be found online. Activated carbon can be used as a substrate for the application of various chemicals to improve the adsorptive capacity for some inorganic (and problematic organic) compounds such as hydrogen sulfide (H2S), ammonia (NH3), formaldehyde (HCOH), mercury (Hg) and radioactive iodine-131(131I). This property is known as chemisorption. Many carbons preferentially adsorb small molecules. Iodine number is the most fundamental parameter used to characterize activated carbon performance. It is a measure of activity level (higher number indicates higher degree of activation-needs citation), often reported in mg/g (typical range 500–1200 mg/g). It is a measure of the micropore content of the activated carbon (0 to 20 Å, or up to 2 nm) by adsorption of iodine from solution. It is equivalent to surface area of carbon between 900 m²/g and 1100 m²/g. It is the standard measure for liquid phase applications. Some carbons are evaluated based on the dechlorination half-life length, which measures the chlorine-removal efficiency of activated carbon. The dechlorination half-value length is the depth of carbon required to reduce the chlorine level of a flowing stream from 5 ppm to 3.5 ppm. A lower half-value length indicates superior performance. Higher density provides greater volume activity and normally indicates better-quality activated carbon. It is a measure of the activated carbon’s resistance to attrition. It is an important indicator of activated carbon to maintain its physical integrity and withstand frictional forces imposed by backwashing, etc. There are large differences in the hardness of activated carbons, depending on the raw material and activity levels. 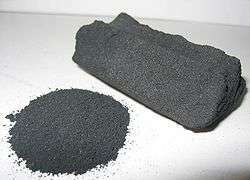 Ash reduces the overall activity of activated carbon and reduces the efficiency of reactivation. The metal oxides (Fe2O3) can leach out of activated carbon resulting in discoloration. Acid/water-soluble ash content is more significant than total ash content. Soluble ash content can be very important for aquarists, as ferric oxide can promote algal growths. A carbon with a low soluble ash content should be used for marine, freshwater fish and reef tanks to avoid heavy metal poisoning and excess plant/algal growth. The finer the particle size of an activated carbon, the better the access to the surface area and the faster the rate of adsorption kinetics. In vapour phase systems this needs to be considered against pressure drop, which will affect energy cost. Careful consideration of particle size distribution can provide significant operating benefits. However, in the case of using activated carbon for adsorption of minerals such as gold, the particle size should be in the range of 3.35–1.4 millimetres (0.132–0.055 in). Activated carbon with particle size less than 1 mm would not be suitable for elution (the stripping of mineral from an activated carbon). Acid-base, oxidation-reduction and specific adsorption characteristics are strongly dependent on the composition of the surface functional groups. The surface of conventional activated carbon is reactive, capable of oxidation by atmospheric oxygen and oxygen plasma steam, and also carbon dioxide and ozone. Oxidation in the liquid phase is caused by a wide range of reagents (HNO3, H2O2, KMnO4). Through the formation of a large number of basic and acidic groups on the surface of oxidized carbon to sorption and other properties can differ significantly from the unmodified forms. Activated carbon can be nitrogenated by natural products or polymers or processing of carbon with nitrogenating reagents. Sulfonic acid functional groups can be attached to activated carbon to give "starbons" which can be used to selectively catalyse the esterification of fatty acids. Formation of such activated carbons from halogenated precursors gives a more effective catalyst which is thought to be a result of remaining halogens improving stability. Some of the chemical properties of activated carbon have been attributed to presence of the surface active carbon double bond. The Polyani adsorption theory is a popular method for analyzing adsorption of various organic substances to their surface. The most commonly encountered form of chemisorption in industry, occurs when a solid catalyst interacts with a gaseous feedstock, the reactant/s. The adsorption of reactant/s to the catalyst surface creates a chemical bond, altering the electron density around the reactant molecule and allowing it to undergo reactions that would not normally be available to it. World's largest reactivation plant located in Feluy, Belgium. The reactivation or the regeneration of activated carbons involves restoring the adsorptive capacity of saturated activated carbon by desorbing adsorbed contaminants on the activated carbon surface. The heat treatment stage utilises the exothermic nature of adsorption and results in desorption, partial cracking and polymerization of the adsorbed organics. The final step aims to remove charred organic residue formed in the porous structure in the previous stage and re-expose the porous carbon structure regenerating its original surface characteristics. After treatment the adsorption column can be reused. Per adsorption-thermal regeneration cycle between 5–15 wt% of the carbon bed is burnt off resulting in a loss of adsorptive capacity. Thermal regeneration is a high energy process due to the high required temperatures making it both an energetically and commercially expensive process. Plants that rely on thermal regeneration of activated carbon have to be of a certain size before it is economically viable to have regeneration facilities onsite. As a result, it is common for smaller waste treatment sites to ship their activated carbon cores to a specialised facilities for regeneration. ↑ ""Properties of Activated Carbon", CPL Caron Link, accessed 2008-05-02". Retrieved 13 October 2014. ↑ Dillon, Edward C; Wilton, John H; Barlow, Jared C; Watson, William A (1989-05-01). "Large surface area activated charcoal and the inhibition of aspirin absorption". Annals of Emergency Medicine. 18 (5): 547–552. doi:10.1016/S0196-0644(89)80841-8. ↑ "Charcoal, Activated". The American Society of Health-System Pharmacists. Retrieved 23 April 2014. ↑ Elliott CG, Colby TV, Kelly TM, Hicks HG (1989). "Charcoal lung. Bronchiolitis obliterans after aspiration of activated charcoal". Chest. 96 (3): 672–4. doi:10.1378/chest.96.3.672. PMID 2766830. 1 2 "Sustainable wastewater treatment of temporary events: the Dranouter Music Festival case study". Water Science and Technology. 58 (8): 1653–7. 2008. doi:10.2166/wst.2008.530. ↑ EPA Alumni Association: Senior EPA officials discuss early implementation of the Safe Drinking Water Act of 1974, Video, Transcript (see pages 15-16). ↑ Activated Charcoal Review Sheet, USDA Organic Materials Review, February 2002. ↑ Activated Carbon Petition, USDA Organic Materials Review petition, Canadaigua Wine, May 2002. ↑ "Alliance for Collaborative Research in Alternative Fuel Technology". All-craft.missouri.edu. Retrieved 2014-03-13. ↑ Bourke, Marta (1989). "Activated Carbon for Mercury Removal". Retrieved 2013-08-27. ↑ Tim Flannery, Here On Earth: A New Beginning, Allen Lane (2011), p. 186. ↑ "''BMT-Begemann, Mercury waste treatment facilities''". Bmt-begemann.nl. Retrieved 2014-03-13. ↑ J.Romanos; et al. (2012). "Nanospace engineering of KOH activated carbon". Nanotechnology. 23 (1): 015401. doi:10.1088/0957-4484/23/1/015401. ↑ "What Is Activated Carbon?". Cabot Norit. Retrieved 24 October 2013. ↑ "SentryAir". SentryAir. Retrieved 2014-03-13. ↑ TIGG Corporation. Granular activated carbon selection. Published 2012-05-8, retrieved 2012-09-21. 1 2 Philippe Serp, José Luis Figueiredo, Carbon Materials for Catalysis, Wiley, – 2009, – 550 p.
↑ Gómez-Serrano, V.; Piriz-Almeida, F. N.; Durán-Valle, C. J.; Pastor-Villegas, J. (1999). "Formation of oxygen structures by air activation. A study by FT-IR spectroscopy". Carbon. 37 (10): 1517–1528. doi:10.1016/S0008-6223(99)00025-1. ↑ Machnikowski J.; Kaczmarska H.; Gerus-Piasecka I.; Diez M.A. ; Alvarez R.; Garcia R. (2002). "Structural modification of coal-tar pitch fractions during mild oxidation – relevance to carbonization behavior". Carbon. 40: 1937–1947. doi:10.1016/s0008-6223(02)00029-5. ↑ Petrov N.; Budinova T.; Razvigorova M.; Ekinci E.; Yardim F.; Minkova V. (2000). "Preparation and characterization of carbon adsorbents from furfural". Carbon. 38 (15): 2069–2075. doi:10.1016/s0008-6223(00)00063-4. ↑ Garcia A.B. ; Martinez-Alonso A.; Leon C. A.; Tascon J.M.D. (1998). "Modification of the surface properties of an activated carbon by oxygen plasma treatment". Fuel. 77 (1): 613–624. 1 2 Saha B.; Tai M.H. ; Streat M. (2001). "Study of activated carbon after oxidation and subsequent treatment characterization". Process safety and environmental protection. 79 (4): 211–217. doi:10.1205/095758201750362253. ↑ Polovina M.; Babic B.; Kaluderovic B.; Dekanski A. (1997). "Surface characterization of oxidized activated carbon cloth". Carbon. 35 (8): 1047–1052. doi:10.1016/s0008-6223(97)00057-2. ↑ Fanning P.E. ; Vannice M.A. (1993). "A DRIFTS study of the formation of surface groups on carbon by oxidation". Carbon. 31 (5): 721–730. doi:10.1016/0008-6223(93)90009-y. ↑ Youssef A.M.; Abdelbary E.M.; Samra S.E. ; Dowidar A.M. (1991). "Surface-properties of carbons obtained from polyvinyl-chloride". Ind. J. of Chem. section a-inorganic bio-inorganic physical theoretical & analytical chemistry. 30 (10): 839–843. ↑ Arriagada R.; Garcia R.; Molina-Sabio M.; Rodriguez-Reinoso F. (1997). "Effect of steam activation on the porosity and chemical nature of activated carbons from Eucalyptus globulus and peach stones". Microporous Mat. 8 (3–4): 123–130. doi:10.1016/s0927-6513(96)00078-8. ↑ Molina-Sabio M.; Gonzalez M.T. ; Rodriguez-Reinoso F.; Sepulveda-Escribano A. (1996). "Effect of steam and carbon dioxide activation in the micropore size distribution of activated carbon". Carbon. 34 (4): 505–509. doi:10.1016/0008-6223(96)00006-1. ↑ Bradley RH, Sutherland I, Sheng E (1996). "Carbon surface: Area, porosity, chemistry, and energy". J. of colloid and interface science. 179 (2): 561–569. doi:10.1006/jcis.1996.0250. ↑ Sutherland I.; Sheng E.; Braley R.H.; Freakley P.K. (1996). "Effects of ozone oxidation on carbon black surfaces". J. Mater. Sci. 31: 5651–5655. doi:10.1007/bf01160810. ↑ Rivera-Utrilla J, Sanchez-Polo M (2002). "The role of dispersive and electrostatic interactions in the aqueous phase adsorption of naphthalenesulphonic acids on ozone-treated activated carbons". Carbon. 40 (14): 2685–2691. doi:10.1016/s0008-6223(02)00182-3. 1 2 Valdés, H.; Sánchez-Polo, M.; Rivera-Utrilla, J.; Zaror, C. A. (2002). "Effect of Ozone Treatment on Surface Properties of Activated Carbon". Langmuir. 18 (6): 2111–2116. doi:10.1021/la010920a. ↑ Pradhan B.K. ; Sandle N.K. (1999). "Effect of different oxidizing agent treatments on the surface properties of activated carbons". Carbon. 37 (8): 1323–1332. doi:10.1016/s0008-6223(98)00328-5. ↑ Acedo-Ramos M.; Gomez-Serrano V.; Valenzuella-Calahorro C.; Lopez-Peinado A.J. (1993). "Oxydation of activated carbon in liquid phase. Study by FT-IR". Spectroscopy letters. 26 (6): 1117–1137. doi:10.1080/00387019308011598. ↑ Gomez-Serrano V.; Acedo-Ramos M.; Lopez-Peinado A.J. ; Valenzuela-Calahorro C. (1991). "Stability towards heating and outgassing of activated carbon oxidized in the liquid-phase". Thermochimica Acta. 176: 129–140. doi:10.1016/0040-6031(91)80268-n.
↑ Stőhr B.; Boehm H.P. ; Schlőgl R. (1991). "Enhancement of the catalytic activiti of activated carbons in oxidation reactions by termal treatment with ammonia or hydrogen cyanide and observation of a superoxide species as a possible intermediate". Carbon. 29 (6): 707–720. doi:10.1016/0008-6223(91)90006-5. ↑ Biniak S.; Szymański G.; Siedlewski J.; Światkowski A. (1997). "The characterizaíion of activated carbons with oxygen and nitrogen surface groups". Carbón. 35 (12): 1799–1810. doi:10.1016/s0008-6223(97)00096-1. ↑ Boudou J.P.; Chehimi M.; Broniek E.; Siemieniewska T.; Bimer J. (2003). 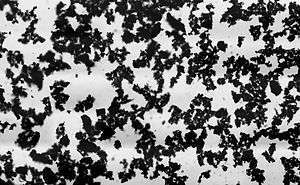 "Adsorption of H2S or SO2 on an activated carbon cloth modified by ammonia treatment". Carbon. 41 (10): 1999–2007. doi:10.1016/s0008-6223(03)00210-0. ↑ Sano H.; Ogawa H. (1975). "Preparation and application nitrogen containing active carbons". Osaka Kogyo Gijutsu Shirenjo. 26 (5): 2084–2086. ↑ Radkevich, V. Z.; Senko, T. L.; Wilson, K.; Grishenko, L. M.; Zaderko, A. N.; Diyuk, V. Y. (2008). "The influence of surface functionalization of activated carbon on palladium dispersion and catalytic activity in hydrogen oxidation". Applied Catalysis A: General. 335 (2): 241–251. doi:10.1016/j.apcata.2007.11.029. ↑ Evans, M. J. B.; Halliop, E.; Liang, S.; MacDonald, J. A. F. (1998). "The effect of chlorination on surface properties of activated carbon". Carbon. 36 (11): 1677–1682. doi:10.1016/S0008-6223(98)00165-1. ↑ Papirer, E. N.; Lacroix, R.; Donnet, J. B.; Nansé, G. R.; Fioux, P. (1995). "XPS study of the halogenation of carbon black—Part 2. Chlorination". Carbon. 33: 63–72. doi:10.1016/0008-6223(94)00111-C.
↑ "XPS Study of the halogenation of carbon black-part 1. Bromination". Carbon. 32: 1341–1358. doi:10.1016/0008-6223(94)90121-X. ↑ Nansé, G.; Papirer, E.; Fioux, P.; Moguet, F.; Tressaud, A. (1997). "Fluorination of carbon blacks: An X-ray photoelectron spectroscopy study: III. Fluorination of different carbon blacks with gaseous fluorine at temperatures below 100 °C influence of the morphology, structure and physico-chemical characteristics of the carbon black on the fluorine fixation". Carbon. 35 (4): 515–528. doi:10.1016/S0008-6223(97)00003-1. ↑ Aldana-Pérez, A.; Lartundo-Rojas, L.; Gómez, R.; Niño-Gómez, M. E. (2012). "Sulfonic groups anchored on mesoporous carbon Starbons-300 and its use for the esterification of oleic acid". Fuel. 100: 128–138. doi:10.1016/j.fuel.2012.02.025. ↑ Diyuk, V. E.; Zaderko, A. N.; Grishchenko, L. M.; Yatsymyrskiy, A. V.; Lisnyak, V. V. (2012). "Efficient carbon-based acid catalysts for the propan-2-ol dehydration". Catalysis Communications. 27: 33–37. doi:10.1016/j.catcom.2012.06.018. ↑ Budarin, V. L.; Clark, J. H.; Tavener, S. J.; Wilson, K. (2004). "Chemical reactions of double bonds in activated carbon: Microwave and bromination methods". Chemical Communications (23): 2736. doi:10.1039/B411222A. ↑ Bagreev, A.; Rhaman, H.; Bandosz, T. J (2001). "Thermal regeneration of a spent activated carbon adsorbent previously used as hydrogen sulfide adsorbent". Carbon. 39 (9): 1319–1326. doi:10.1016/S0008-6223(00)00266-9. 1 2 Sabio, E.; Gonzalez, E.; Gonzalez, J. F.; Gonzalez-Garcia, C. M.; Ramiro, A.; Ganan, J (2004). "Thermal regeneration of activated carbon saturated with p-nitrophenol". Carbon. 42 (11): 2285–2293. doi:10.1016/j.carbon.2004.05.007. ↑ Miguel GS, Lambert SD, Graham NJ (2001). "The regeneration of field spent granular activated carbons". Water Research. 35 (11): 2740–2748. doi:10.1016/S0043-1354(00)00549-2. PMID 11456174. ↑ Alvarez PM, Beltrán FJ, Gómez-Serrano V, Jaramillo J, Rodríguez EM (2004). "Comparison between thermal and ozone regenerations of spent activated carbon exhausted with phenol". Water Research. 38 (8): 2155–2165. doi:10.1016/j.watres.2004.01.030. PMID 15087197. ↑ Martin, R. J.; Wj, N (1997). "The repeated exhaustion and chemical regeneration of activated carbon". Water Research. 21 (8): 961–965. doi:10.1016/S0043-1354(87)80014-3. ↑ Aizpuru A, Malhautier L, Roux JC, Fanlo JL (2003). "Biofiltration of a mixture of volatile organic compounds on granular activated carbon". Biotechnology and Bioengineering. 83 (4): 479–488. doi:10.1002/bit.10691. PMID 12800142. ↑ Narbaitz RM, Karimi-Jashni A (2009). "Electrochemical regeneration of granular activated carbons loaded with phenol and natural organic matter". Environmental Technology. 30 (1): 27–36. doi:10.1080/09593330802422803. PMID 19213463. ↑ Lim JL, Okada M (2005). "Regeneration of granular activated carbon using ultrasound". Ultrasonic-Sono-Chemistry. 12 (4): 277–285. doi:10.1016/j.ultsonch.2004.02.003. PMID 15501710. ↑ Shende RV, Mahajani VV (2002). "Wet oxidative regeneration of activated carbon loaded with reactive dye". Waste Management. 22 (1): 73–83. doi:10.1016/S0956-053X(01)00022-8. PMID 11942707. Wikimedia Commons has media related to Activated carbon. Engber, Daniel (Nov. 28, 2005). "How Does Activated Carbon Work?". Slate.